The Johnstown Tomahawks are coming off one of their best weekends so far this season, winning two out of three games. Instead of a regular goal-by-goal review, here are five takeaways from this past weekend's games. Out of three games this weekend, Johnstown's only loss came on Friday night. Though the final score would be 9-6, in New Jersey's favor, the Tomahawks didn't play a bad game. No. They just played a terrible second period. The Tomahawks went into the second period with the score tied at two. It was an exciting, back-and-forth game after one period of play. Then, for a period, the Tomahawks totally fell apart, and gave up a total of six goals. One of those goals came on the power play and another came shorthanded. It seemed for that second period, everything the Titans threw on net was going in (and basically did). It didn't matter who was in net for Johnstown, Leavy or League, the puck had no problem getting into the back of Johnstown's net. In total, Johnstown outshot the Titans in the game, 40-29. In the second period, the Titans placed 10 shots on net with 60% of their shots going in. In the third period, Johnstown tried mounting a comeback, but the damage was already done. If not for that second period, the Tomahawks could have had a possible perfect weekend. 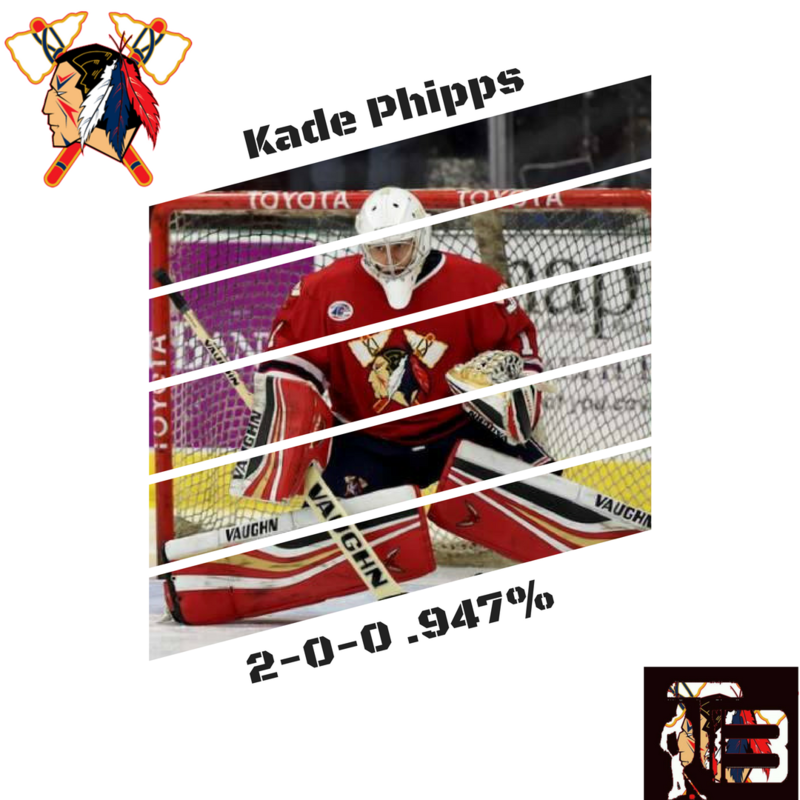 The following two games, Saturday and Sunday, saw a brand new netminder in net for the Tomahawks; Kade Phipps. As Mike Mastovich reported in the Tribune-Demorcat after Saturday night's game, Phipps was picked up by the Tomahawks on Monday, as Britt League had been called up to Youngstown and they didn't know if League would be back or not for the three-game weekend. Well, League was returned, but Phipps stayed with the team, practicing, and allowing coach Letizia to get a look at the 1998 birth-year goalie. On Friday night, Titan's backup goalie, Matt Ladd left the game with a lower body injury. This caused the Titans to have to bring in their "emergency" backup goalie. Regular starter Brandon Perrone was already out of the lineup due to an injury of his own. Short a backup goalie for Saturday and Sunday's game, the Titans hoped they could bring Phipps to their team. As the Tribune-Demorcat article explained, Phipps thought it'd be better for him to stay with Johnstown, and luckily for Johnstown, he did just that. Phipps would play Saturday and Sunday's games for Johnstown and played stellar. On Saturday, he took a shutout into the third period, eventually giving up three goals in the 4-3 win. On Sunday, he took another shutout into the third period and this time allowed a lone Titan's goal in the third, giving Johnstown a 5-1 win. In total, Phipps faced 76 shots and only allowed four goals. It was an impressive showing for the new Tomahawks' netminder and one of the key elements that helped Johnstown take four out of six points from an overly cocky New Jersey team. Earlier today the North American Hockey League annouced that Johnstown Tomahawks' forward, Andy Nedeljkovic was named as East Division Player of the Week. Nedeljkovic had a great weekend, and his best weekend since joining the Tomahawks from the USHL earlier this season. In three games, Nedeljkovic scored five points (three goals, two assits). 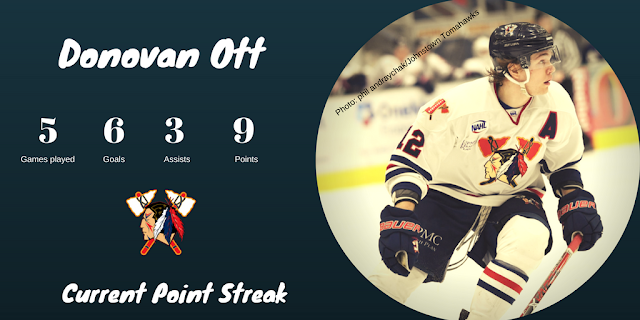 Three of those points came during Sunday's 5-1 Tomahawks win. Also in the announcement, Ben Schmidling was listed as an honorable mention for his four point weekend (two goals, two assists). During the weekend series the Tomahawks scored six power play goals against the Titans. One on Friday, two on Saturday, and three on Sunday. Overall, the Tomahawks have the league's eighth best power play scoring 21.6% of the time. 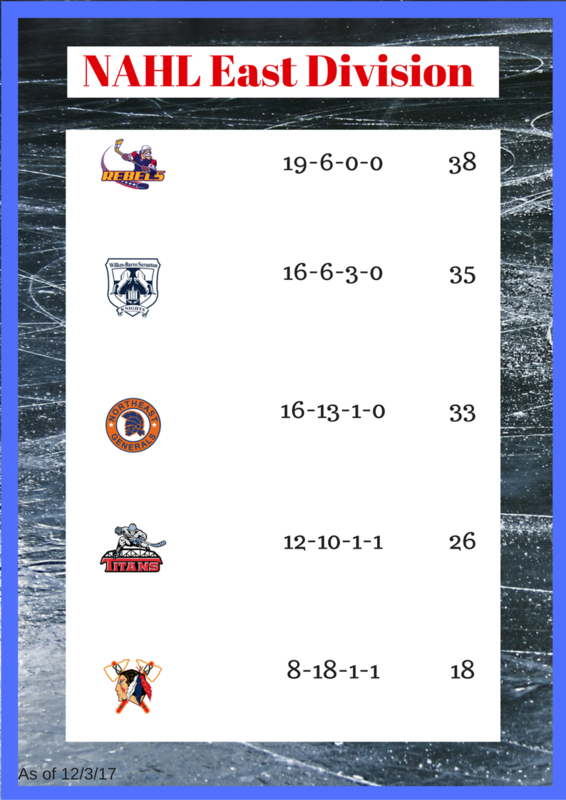 This is quite impressive considering that the Tomahawks currently have the worst record in the league, 8-18-1-1, and have one of the fewest team goals scored in the league with 68 total. Thought the Tomahawks are still the worst team in the league, they are trending up. Currently, they're the second hottest team in the division in their last ten games (5-4-0-1). In that span they, as a team, have a goal differential of +2. Considering that the team has only won eight games all year, and five of them have taken place in the last ten games, there's a lot to get excited about as the season moves along. 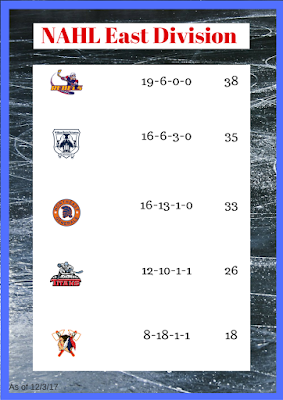 The Tomahawks are only eight points back from tying the Titans for the last playoff spot in the East division. If the Tomahawks can find a way to fight back and make the playoffs this season, it'll make for quite the story. Two of the Tomahawks best players are showing exactly why they're two of the Tomahawks best players. This past weekend Samuel Solensky scored four points vs New Jersey (four assists) and had his first ever fight when he dropped the gloves with Titan's tough d-man, Holden Biebel. With one point on Friday night, another on Saturday, and then two on Sunday, Solenski is currently on a seven-game scoring streak. In those seven games he has three goals, and seven assists. His streak started back on November 10th. Donovan Ott also had a nice weekend vs the Titans where he also registered four points (three goals, one assist). Like his linemate, Ott is on a scoring streak himself. His is at five games which has seen him score six goals and three assists. Ott's streak started back on November 17th.